This report is preliminary and has not been reviewed for conformity with U.S. Geological Survey editorial standards (or with the North American Stratigraphic Code). Any use of trade, product, or firm names if for descriptive purposes only and does not imply endorsement by the U.S. Government. We used two methods of estimating rock-fall potential in the Yosemite Valley, California based on (1) physical evidence of previous rock-fall travel, in which the potential extends to the base of the talus, and (2) theoretical potential energy considerations, in which the potential can extend beyond the base of the talus, herein referred to as the rock-fall shadow. Rock falls in the valley commonly range in size from individual boulders of less than 1 m3 to moderate-sized falls with volumes of about 100,000 m3. Larger rock falls exceeding 100,000 m3, referred to as rock avalanches, are considered to be much less likely to occur based on the relatively few prehistoric rock-fall avalanche deposits in the Yosemite Valley. Because the valley has steep walls and is relatively narrow, there are no areas that are absolutely safe from large rock avalanches. The map shows areas of rock-fall potential, but does not predict when or how frequently a rock fall will occur. Consequently, neither the hazard in terms of probability of a rock fall at any specific location, nor the risk to people or facilities to such events can be assessed from this map. The Yosemite Valley of California is in the upper portion of the canyon of the Merced River, which was deepened during several episodes of glacial erosion (Huber, 1987). The most recent glacial advance, referred to as the Tioga glaciation peaked between about 28,000 and 17,000 y BP (Bursik and Gillespie, 1993). The maximum extent of Tioga glaciation reached Bridalveil Meadow in the Yosemite Valley and is shown on the map based upon Matthes (1930). The maximum extent of Pre-Tahoe (oldest) glaciation of the area is depicted on the map by the boundary showing the unglaciated region (based on Matthes, 1930). At a relatively low elevation, most of the Yosemite Valley was probably free of glacial ice by about 15,000 y BP (Wieczorek and Jäger, 1996). After the retreat of Tioga ice from the valley, glacial Lake Yosemite formed behind a recessional moraine at the western edge of El Capitan Meadow and extended to the east far up the valley (Matthes, 1930). Rock falls have been depositing on the relatively flat valley floor during the last 15,000 years and these deposits probably interfinger with and lie on top of the deltaic and lacustrine sediment that filled glacial Lake Yosemite. Relatively small rock falls and slides have occurred within relatively the hard, jointed, granitic rocks below the level of Tioga glaciation, such as from Liberty Cap. Between the level of Tioga glaciation and the unglaciated boundary the rocks have been weakened by prolonged exposure to weathering for more than the last 1 million years. Large rock falls and rock avalanches have initiated in this zone of weathered rock, most notably at Mirror Lake, Middle Brother, and Happy Isles. Many of the larger debris slides and flows have also initiated in saprolite or colluvium within this zone of weathered rock above the level of Tioga glaciation. Only a few large rock avalanches, such as that below El Capitan (d on map), have reached near the center of the valley. Very fluid debris flows have carried rocky debris far into the valley even on moderately gentle slopes. To the west of Bridalveil Meadow the valley narrows and talus from rock falls and rock slides extends from the cliffs down to both banks of the Merced River. were based on Wieczorek et al. (1992). Three relative ages of rock falls were identified: prehistoric (pre 1850), historical (1850-1970), and recent (1970-present). As a result of additional photo interpretation and field mapping the extent of rock-fall deposits was modified. Rock falls in the Yosemite Valley were included in the language and legends of the Native Americans. For example, their name for Rocky Point or the talus cone below Middle Brother, a frequent site of rock falls, was We-ack , understood to mean fallen rocks. Prehistoric rock-avalanche deposits, such as those that blocked Tenaya Canyon and formed Mirror Lake, are recognized at several locations. Native Americans occupied rock shelters among large boulders at the toe of the Mirror Lake rock avalanche. During historical time more than 400 rock falls have been documented. Nine people have been killed by rock falls and many others injured. Sections of many trails and roads, as well as buildings have been destroyed or seriously damaged by rock falls (Wieczorek et al., 1992). In Yosemite earthquakes, rainstorms, cycles of freeze-thaw, or sudden warm fronts producing a rapid melting of snow trigger many rock falls. The magnitude and proximity of earthquakes, intensity and duration of rainfall during a storm, number of cycles of freeze-thaw, and thickness and rate of melting of a snowpack, effect the triggering of rock falls (Wieczorek and Jäger, 1996). However, some rock falls are not triggered by these events, but are probably caused by more gradual influences, such as stress release and exfoliation of the granitic rocks (Wieczorek et al., 1995), root penetration and expansion in joints, and chemical and mechanical weathering of rock reducing its strength. Rock falls have created abundant deposits of talus around the base of Yosemite Valley. Matthes (1930) mapped the extent of talus around the edge of the valley that, in some places, such as west of Mirror Lake is estimated to be greater than 100 m thick (Wieczorek and Jäger, 1996). Rock falls in the Yosemite Valley range from small blocks less than 1 m3 to rock avalanches of several million cubic meters. All events pose a potential hazard, because even a small rapidly moving boulder can cause serious injury to a person or significant damage to vehicles or buildings. The size and frequency distribution of rock falls has been determined from an analysis of historical rock falls (Fig. 1) (Wieczorek et al., 1995). For example, the frequency for rock-fall events with volumes equal or greater than the 1996 Happy Isles rock fall (approximately 30,000 m3) is about 0.09 events per year (Fig. 1), equivalent to an average recurrence period of about 11 years. Probably only five rock avalanches have occurred since the retreat of the Tioga glacier from the valley about 15,000 years BP (Table 1) (Wieczorek and Jäger, 1996). The National Park Service (NPS) requested the U.S. Geological Survey to assess the available information and to evaluate the potential for future rock falls for land-use planning in Yosemite Valley. In the eastern part of the Yosemite Valley, Wieczorek et al. (1998) examined rock-falls at a few specific locales. 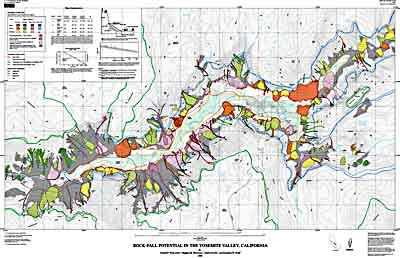 In this report we have assessed rock-fall potential for a larger portion of Yosemite Valley, from Tenaya Canyon (east of Mirror Lake) to west of Bridalveil Meadow. We have evaluated rock-fall potential rather than rock-fall hazard because when a rock fall will occur, what the average recurrence interval might be, or what the size might be cannot be predicted. We employed two methods of identifying rock-fall potential, one related to the location of the base of the talus formed by the maximum extent of contiguous rock-fall deposits. The other method was based on the location of the rock-fall shadow that depends on the minimum shadow angle of outlying boulders as defined by Evans and Hungr (1993). We did not evaluate rock-fall induced airblasts (Morrissey et al., 1999; Wieczorek et al., 2000), or limits of potential airborne projectiles (flyrock) from rock falls (Wieczorek and Snyder, 1999). In the field, we reexamined the limit of individually distinguishable rock-fall deposits that had been previously mapped (Wieczorek et al., 1992). At most locations, large accumulations of blocks from rock falls made the base of talus easy to define; however, in other locations, this determination was more difficult, particularly if vegetation or soil had buried the surface of older debris-flow deposits or if human modification had altered the area. Debris-flow deposits are abundant in Yosemite Valley. Matthes (1930) mapped fans, which he described as composed mostly of coarse rock waste, produced by torrent action, but he did not specifically identify debris-flow deposits in the Yosemite Valley. Large fans composed predominantly of debris-flow deposits are found where Eagle, Sentinel, Bridalveil and Indian Creeks enter the Yosemite Valley. On the basis of depositional fabric and clast size we distinguished matrix-supported coarse boulders (> 0.3 m) of debris-flow deposits from fluvial deposits that are grain supported and may lack large clasts. Most rocks that break loose from the valley walls will stop moving within the talus that has previously accumulated; however, a few, larger individual boulders may rarely travel further beyond the base of the talus. These scattered outlying boulders or outliers illustrate the potential for movement beyond the base of talus slopes. Locations and estimated sizes of some outlying boulders are contained in Wieczorek et al. (1998). We employed the concept of a rock-fall shadow, which defines the distance that individual rocks may travel by bouncing, sliding or rolling beyond the base of the talus (Hungr and Evans, 1988; Evans and Hungr, 1993). The general relationship between the valley walls, talus, outlying boulders, and rock-fall shadow is portrayed in Fig. 2. The minimum shadow angle (Evans and Hungr, 1993) defines the angle extending horizontally from the apex of the talus slope to the farthest outlying boulder (Figure 2). The minimum shadow angle is used to define the limit of the rock-fall shadow where infrequent rock-fall events may stop. Based on measurements of outlying boulders in the Yosemite Valley, we selected a minimum shadow angle of 22 degrees (Wieczorek et al., 1998). Selecting a higher shadow angle would move the shadow line on the map closer to the valley walls. The limit of travel distance defined by the rock-fall shadow does not apply to the runout distance for large rock avalanches or flyrock. Rock-fall deposits in the Yosemite Valley range in age from prehistoric to present. Most prehistoric deposits in the Yosemite Valley east of Bridalveil Meadow are presumed to have accumulated since the retreat of the most recent Tioga glaciation about 15,000 years BP since advancing glaciers would likely have removed or modified rock-fall deposits. To the west of Bridalveil Meadow beyond the limit of Tioga glaciation rock-fall deposits may have accumulated over significantly longer periods of time. The presence of only prehistoric rock-fall deposits at a given site indicates that the interval between successive rock-fall events may be long, perhaps centuries to millennia. For example, much of Curry Village is built among large boulders deposited by several large prehistoric rock falls/slide(s), but no comparably-sized rock-fall events have occurred during the last 150 years. Native Americans have lived in the Yosemite Valley for at least 3000 years (Riley, 1987). Lengthy occupation of some prehistoric rock-fall sites by Native Americans suggests that some rock-fall deposits may be of similar age, but precise dating of these prehistoric deposits is lacking. The assessment of rock-fall potential in the Yosemite Valley is complicated by the possibility of different types of mass movement. Debris flows with a higher proportion of water than debris slides, rock slides, and rock falls can transport boulders longer distances over relatively gentle slopes. The boulders deposited at the terminus of a debris flow can extend into the valley. At a few locations, such as Upper Pines Camp, successive deposition of debris flows has built a fan that extends beyond the limit of the rock-fall shadow. Lateral and vertical interfingering of debris-flow deposits makes distinction of individual debris-flow units difficult, although they may have occurred separately over decades or longer. Coalescing debris-flow fans exist along much of the valley from below Cathedral Spires to below Sentinel Dome, generally only the largest and most recent debris-flow deposits can be individually mapped. During our recent mapping we found that the base of talus did not always agree with the limit of previously mapped rock-fall deposits (Wieczorek et al., 1992). For example, south of Yosemite Village the base of the talus was extended slightly south beyond the area of previously mapped deposits. In the vicinity of Yosemite Lodge additional information from boreholes (Kleinfelder, 1997) validated the base of talus identified from surface mapping and defined a slight southerly extension of the base of talus along Northside Drive. Additional boreholes in other parts of the valley could provide evidence of talus where human modification from construction of roads and buildings over the last century has obscured rock-fall deposits. Decisions regarding the hazards to existing or planned structures should be based on detailed site specific investigations, which determine the base of talus, based on a combination of surface evidence and subsurface exposures in shallow trenches or boreholes. The base of talus is a physical boundary observed in the field, however, the rock-fall shadow is a theoretical threshold based on physical measurement of outlying boulders that have traveled beyond the base of talus. The extension of the rock-fall shadow towards the center of the valley reflects less and less likely events. The particular limit of 22 degrees that we have selected for the shadow angle approximates the farthest likely travel distance for outliers from rock falls excluding large rock avalanches. The estimated volumes of five prehistoric rock avalanche deposits in Yosemite Valley are listed in Table 1 (a-e). These rock-avalanche deposits show evidence of coherent mass movement and the boundaries of some deposits extend beyond the rock-fall shadow. The rock-avalanche deposit below Royal Arches (a on the map) extends to the junction of Tenaya Creek and the Merced River, about 250 m beyond the rock-fall shadow. The travel distance of rock avalanches in Yosemite as a function of volume is comparable to other worldwide data from Li (1983) as shown in Figure 3. Areas of lower rock-fall potential within both the base of talus and rock-fall shadow are identified. However unlikely, large rock avalanches starting from high cliffs are capable of traveling far into the Yosemite Valley. The abundance of scars of rock falls high on the valley walls and their voluminous deposits attest to previous large rock falls. Because of the relatively small number of recognized large rock-avalanche deposits that occurred within Yosemite Valley in the last 15,000 years, an average recurrence cannot be reliably determined. Due to the configuration of the high steep valley walls and the relatively narrow valley, there are probably no areas absolutely safe from potential rock falls. The ample prehistoric and historic evidence of rock falls within the Yosemite Valley documents a risk posed by rock falls of even small size capable of causing casualties and damage to structures. Acceptable levels of risk for engineering projects typically depend upon the annual probability of failure versus the consequence of failure, that is monetary loss or lives lost (Fell, 1993). This study indicates where the highest potential for rock falls exists, but does not give indication of the frequency of these events. The study has not quantified the probability at any specific location, nor evaluated the risk, that is the exposure of people or facilities to such hazardous events. The National Park Service provided partial financial and logistical support for this work. This work was partially supported through a CNR International Scholarship (203.05.18-1996) to Giulio Iovine, one of the authors. Bursik, M.I., and Gillespie, A.R., 1993, Late Pleistocene glaciation of Mono Basin, California: Quaternary Research, v. 39, p. 24-35. Cruden, D.M., and Varnes, D.J., 1996, Landslide types and processes: Chapter 3 in Landslides: Investigations and Mitigation, Turner, A.K., and Schuster, R.L., eds. Transportation Research Board, Special Report 247, p. 36-71. Evans, S.G., and Hungr, O., 1993, The assessment of rockfall hazard at the base of talus slopes: Canadian Geotechnical Journal, v. 30, pp. 620-636. Fell, Robin, 1994, Landslide risk assessment and acceptable risk: Canadian Geotechnical Journal, v. 31, pp. 261-272. Huber, N.K., 1987, The geologic story of Yosemite National Park, U.S. Geological Survey Bulletin 1595, 64p. Hungr, O. and Evans, S.G., 1988, Engineering evaluation of fragmental rockfall hazards. In Landslides, Proceedings of the 5th International Symposium on Landslides, Lausanne. Ed. C. Bonnard. A.A. Balkema, Rotterdam. V. 1, pp. 685-690. Kleinfelder, Inc., 1997, Geotechnical investigation report Yosemite Lodge redevelopment Yosemite National Park, Mariposa County, California: unpublished report, file no. 21-5102--1 B00, 34 p.
Li, Tianchi, 1983, A mathematical model for predicting the extent of a major rockfall: Zeitschrift fur Geomorphologie, v. 27, n. 4, pp. 473-482. Matthes, F.E., 1930, Geologic history of the Yosemite Valley: U.S. Geological Survey Professional Paper 160, 137 p.
Morrissey, M.M., Savage, W.Z. and Wieczorek, G.F., 1999, Airblasts generated from rock-fall impacts: analysis of the 1996 Happy Isles event in Yosemite National Park: Journal of Geophysical Research, v. 104, n. B10, pp. 23189-23198. Riley, L.M., 1987, Archeological investigations in the Merced River canyon—Report of the 1983 El Portal archeological project: Yosemite Research Center, Yosemite National Park, National Park Service, Publications in Anthropology No. 3, 231p. Wieczorek, G.F., Snyder, J.B., Alger, C.S., and Isaacson, K.A., 1992, Rock falls in Yosemite Valley, California: U.S. Geological Survey Open-File Report 92-387, 38 p., 2 appendixes, 4 plates. Wieczorek, G.F., Nishenko, S.P., and Varnes, D.J., 1995, Analysis of rock falls in the Yosemite Valley, California, in Proceedings, Rock Mechanics Symposium, 35th, Reno: Nevada, University of Nevada, Daemen, J.J. and Schultz, R.A., eds., Balkema, Rotterdam, p. 85- 89. Wieczorek, G.F., and Jäger, Stefan, 1996, Triggering mechanisms and depositional rates of postglacial slope-movement processes in the Yosemite Valley, California: Geomorphology, v. 15, p. 17- 31. Wieczorek, G.F., Morrissey, M.M., Iovine, G., and Godt, J., 1998, Rock-fall Hazards in the Yosemite Valley: U.S. Geological Survey Open-file Report 98-467, 1:12,000. Wieczorek, G.F., Snyder, J.B., Waitt, R.B., Morrissey, M.M., Uhrhammer, R., Harp, E.L., Norris, R.D., Bursik, M.I., and Finewood, L.G., 2000, The unusual air blast and dense sandy cloud triggered by the July 10, 1996, rock fall at Happy Isles, Yosemite National Park, California: Geological Society of America Bulletin, v. 112, n. 1, p. 75-85.